Honor the Past. Be Present Now. Build the Future. 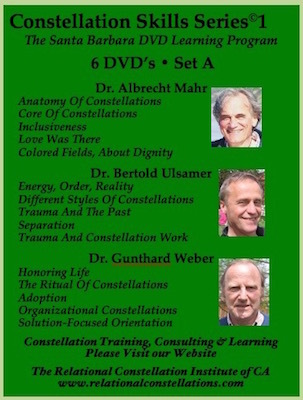 Dr. Albrecht Mahr, Dr. Gunthard Weber and Dr. Bertold Ulsamer all worked together with Bert Hellinger for many years and are the original innovators and trainers in the field of Constellation Work. The DVDs comprise an excellent, edited version of a 6-Day Intensive Training that was held in Santa Barbara with the master teachers and originators of Constellation Work. Watching is an effective way to learn to do Constellation work, to see it being facilitated in different styles by experts, to hear explanations and teachings about Systemic Constellations, Family Constellations, Relational Constellations, Structural Constellations, and Organizational Constellations. There are a total of 12 Family Constellation DVDs broken down into two different series. For private, professional, educational use only. For US mail orders, add $10/series for shipping & handling. If you are outside the US, please inquire. 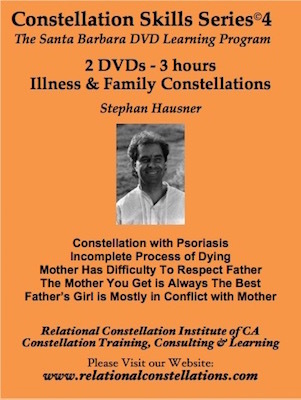 In this 3-hour DVD set, renowned Constellation Work facilitator and educator, Stephan Hausner, facilitates constellations and shows how physical illness becomes harmonized with the constellation process. In this 5-hour DVD set, Victoria "Sneh" Schnabel, explores the link between trauma, shamanism, and Constellation Work. "I will live well Grandfather..."
"Will there be enough, mom...?" "I'm so proud of you, daughter..."
Be the first to know about upcoming workshops and other news. Thank you! Now check your email inbox for a confirmation. If you don't see it there, try checking your spam folder as well.